Tuesday is Equal Pay Day, which means that a woman has to work this far into 2016 to earn the same that a man did in 2015 alone. A couple local businesses in New Hampshire are taking a unique approach to balance the scales and get people talking. "You would think we would have reached wage parity before this," said Mary Rauh of New Castle, New Hampshire. Rauh has been fighting for equal pay since she started teaching more than 56 years ago. "Then, when I got married, I was paid even less and they explained to me back then that 'you're husband earns most of the money,'" Rauh said laughing. "Imagine, a teacher, high school, and full time." Tuesday, in an effort to raise awareness about pay discrimination, Rauh and many others bought lunch at The Works Cafe in Portsmouth. "A donnar, sixty-eight off, how about that," Rauh said. Since women are paid less than men, women paid less than men at The Works on Tuesday. Women got a 21 percent discount on their bills, recognizing that women still earn just 79 cents for every one dollar that men earn. On average, that's a difference of about $11,000 every year and $450,000 in a lifetime. "I think it's important to call attention to this fact, it's crazy," said Portsmouth resident Monica Dorley. Her fiancé, Jen Scumaci, agrees, saying, "I'd like to have the same rights and privileges as men." 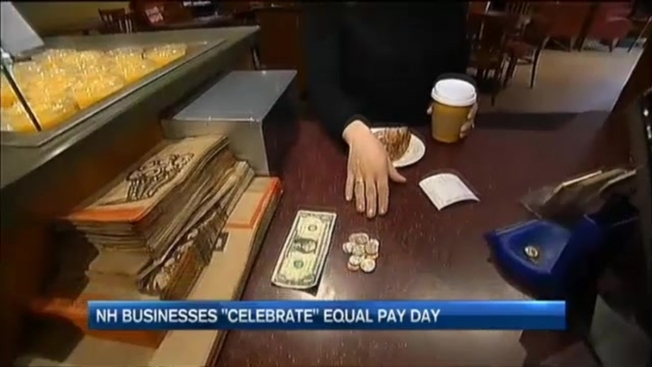 The Equal Pay Day event drew a large crowd at The Works and at a handful of other businesses across the state. A group of Portsmouth High School seniors who haven't even entered the workforce yet, tell NECN they couldn't pass up the chance to grab a coffee and take a stand. "We are going out and getting jobs in the world and we want the same opportunity and pay as men," said Zoe Sprankle. It turns out, seeing the numbers on your lunch order is making a difference. "It definitely makes you more aware on a day-to-day basis," said Eliot, Maine resident Anne Dangelman. "It makes you want to fight for equality." Just the way Ruah has for the better part of a century. "Still fighting, still fighting, that's what's so amazing," she said Tuesday as she enjoyed her bagel sandwich. Advocates say the major milestones in this fight will come when Congress passes a paycheck fairness act, a minimum wage hike, and paid family leave.